I have begun to think yard sales this summer are a bust. I have only been to a few before today and it seems that people put too much value in the stuff they want to get rid of. So I haven’t purchased very much. I am also maxed out in the junk department and I really need to purge my home before I start adding too many more trinkets. That has a tendency to put the kabosh on shopping for junk, too. Where am I going to put it? What am I going to do with it? 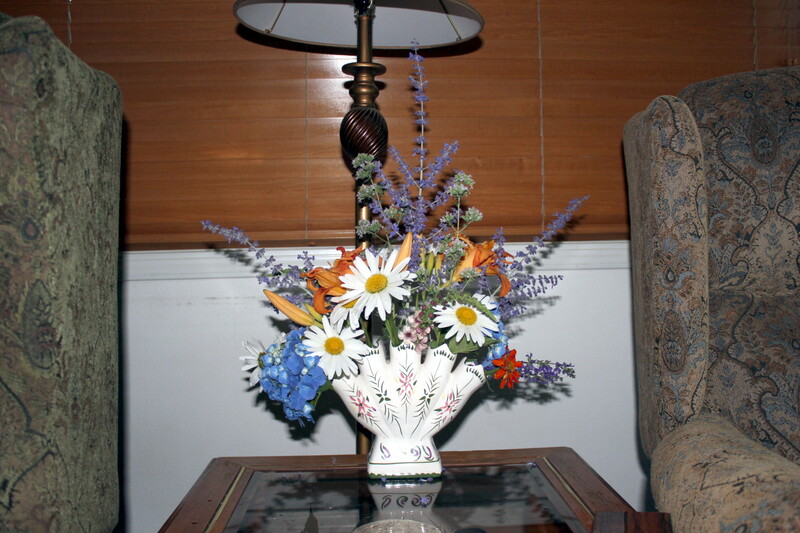 A couple of weeks ago, I picked up this vase for twenty-five cents. I am a sucker for funky vases and this one is funky. Funky, but utilitarian. Now that’s the kind of bargain I like to find when I’m out “shopping” other people’s junk. 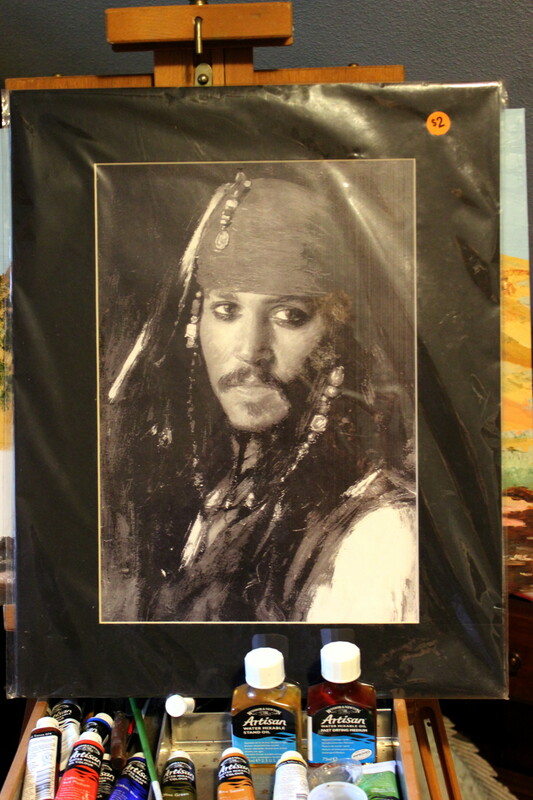 There’s a story behind Captain Jack here. I have a couple Internet friends who are in love with Johnny Depp. And this (cheap) (but excellent condition) poster made me think of the pair of them. I still have to package it and ship it, but it is going to one very pleased Internet friend in the very near future. 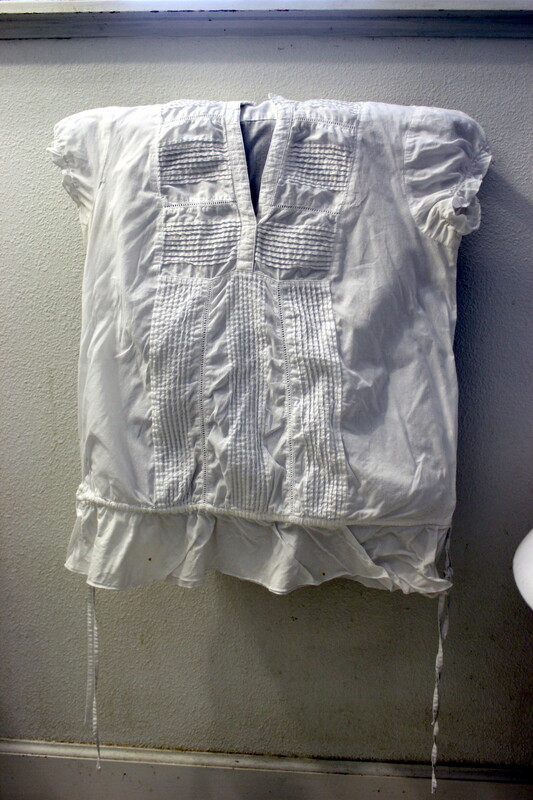 I bought this darling blouse last weekend. Paid a dollar for it. After I got it home and really looked at it, I found this. 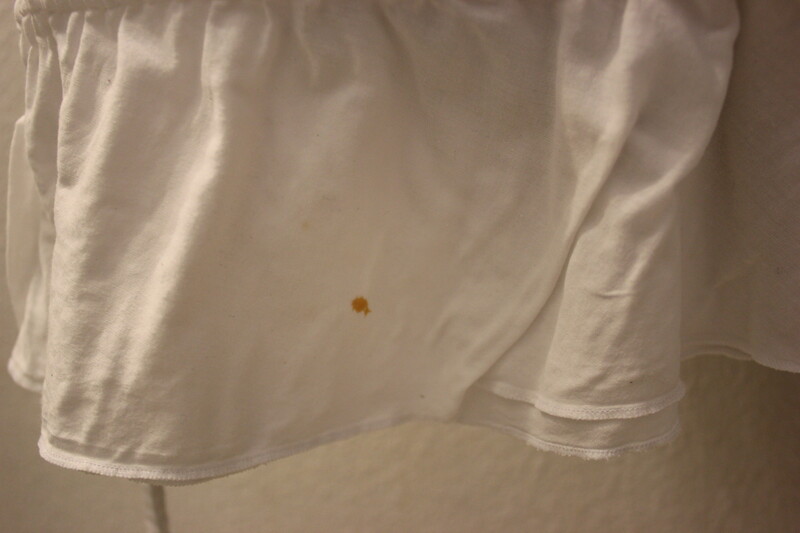 Actually, there are two red greasy stains like that on it. Why do people sell the stuff they know is stained? Just throw it away or make a rag out of it! 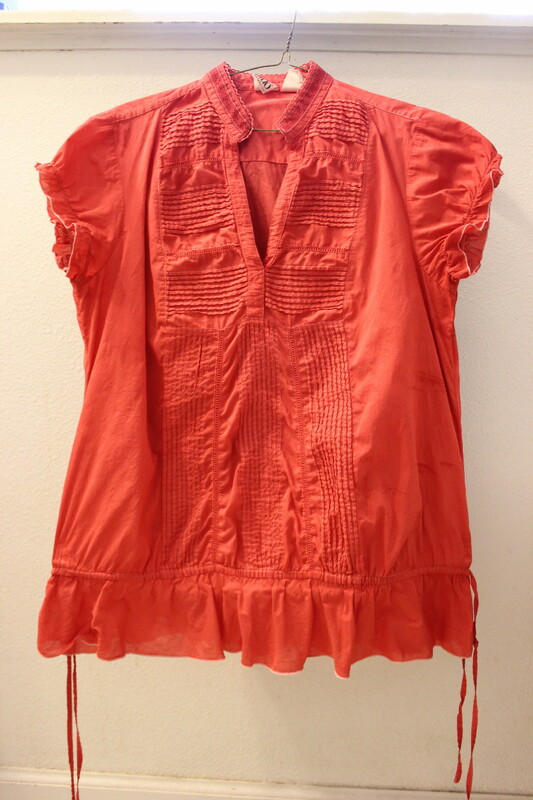 I liked that blouse enough that I decided to try dyeing it the same color as the little stains. New life! I’ll get a little bit of wear out of it for my dollar + RIT dye. Today was the big “McLoughlin Historic Neighborhood Garage Sale” which is a sweet small town event where many of the neighbors in the older part of Oregon City (the oldest city on the West Coast, by the way) sell their stuff. There’s a traveling antique dealer who sets out all the stuff he couldn’t sell on the road, a church that throws a rummage sale, and a myriad of folks who just want to get in on the fun and make a few bucks. The sales tend to be clustered together, so it is best to park your car and wear comfortable shoes. You can walk five or six blocks and circle around, return to your car and move to the next cluster. That way, if you buy something bulky your car is never too far away. One busy street slices through the neighborhood, but in Oregon City drivers are polite: when a pedestrian steps off the curb, everyone stops. Most of the time, anyway. It’s a small town and folks are friendly. I did find a few things today that I wanted enough to pay the prices asked. The tiles came from one sale. I have no idea what I will use them for, but they were cheap and I know I will use them. I will probably use them as pavers in one of my garden beds. But the plant stand… I went out looking for one. I have a little project in mind. I wasn’t actually picturing a wrought iron plant stand. This one had a big, ugly vintage 1960’s planter sitting lopsided in it. And a price tag of $15. I told the seller (that antique dealer I mentioned) that I did not want the planter. He said he’d sell the whole thing to me for $12 *if* I would take the planter, too. I took the vintage ceramic planter. Remember that. 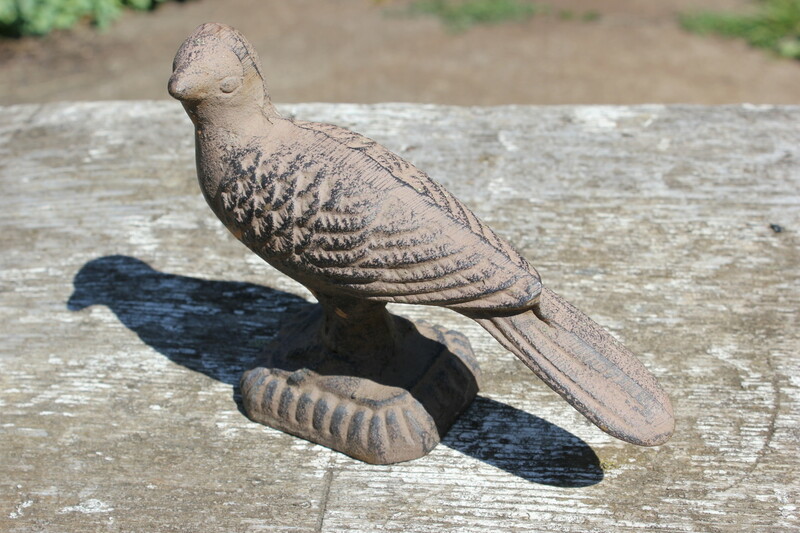 I also bought this cast iron bird from him. $5. About 6″ long. Not sure what it used to go on top of, but am very certain I will find a new use for it soon. 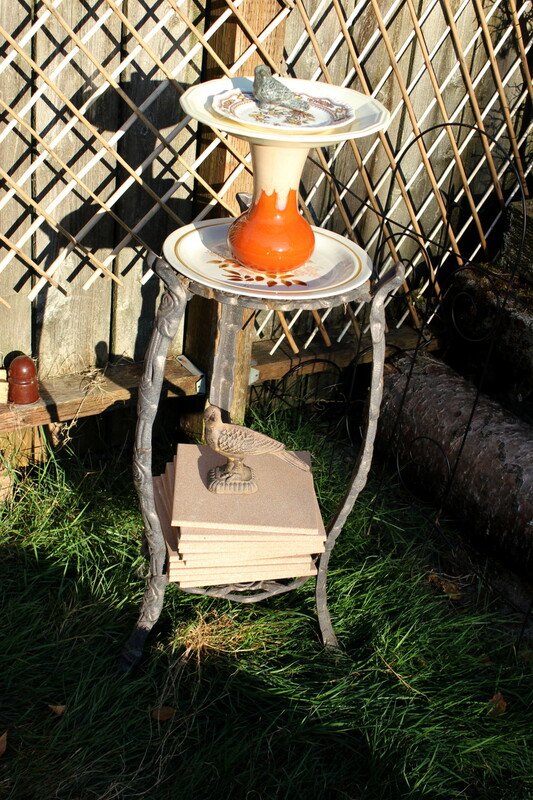 Some sort of use like this (I just put this together for the photo – the ceramic tiles are definitely not going to go there but the little bird feeder most certainly will go there). I found this mirror at one sale ($3). The boots were at another sale ($5). The boots aren’t much until you remember that I have nifty little Faerietoes from Faerieworlds. Those boots are perfect! 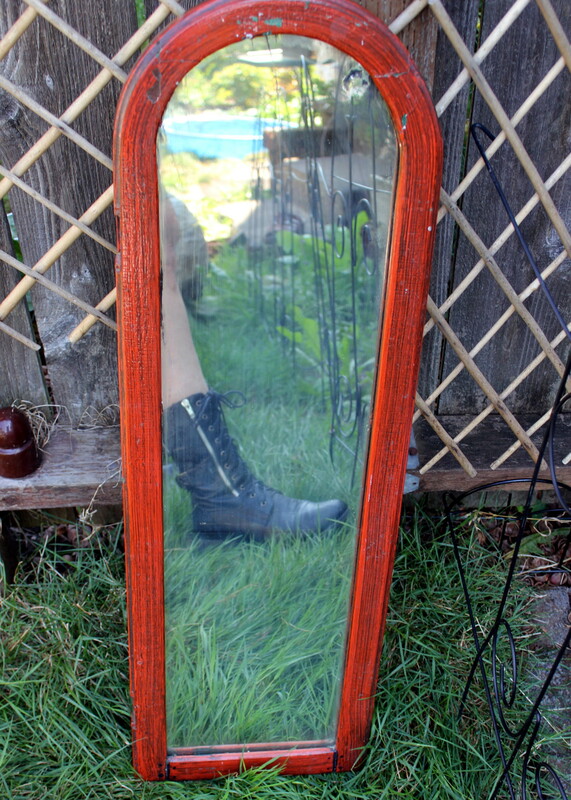 And the vintage mirror? 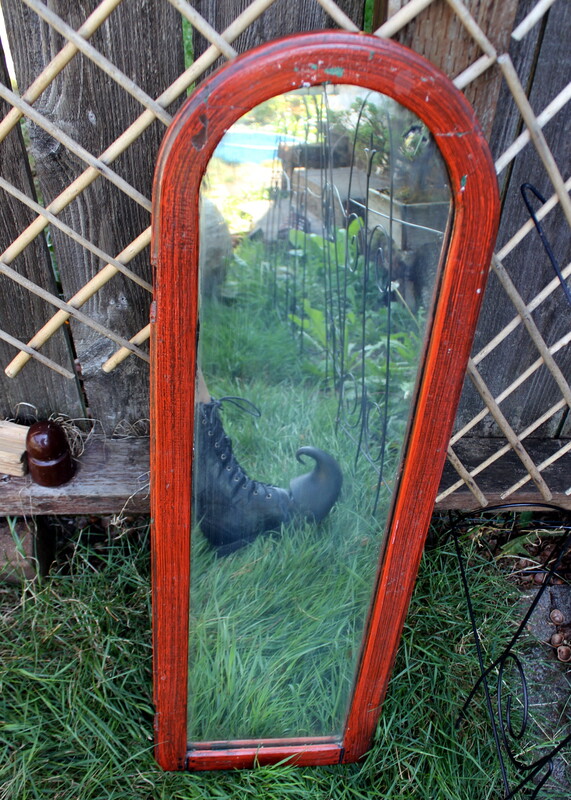 Well, I definitely have a place for the mirror – and a use. If you know me at all, you know what a great find this is! Hardbound. 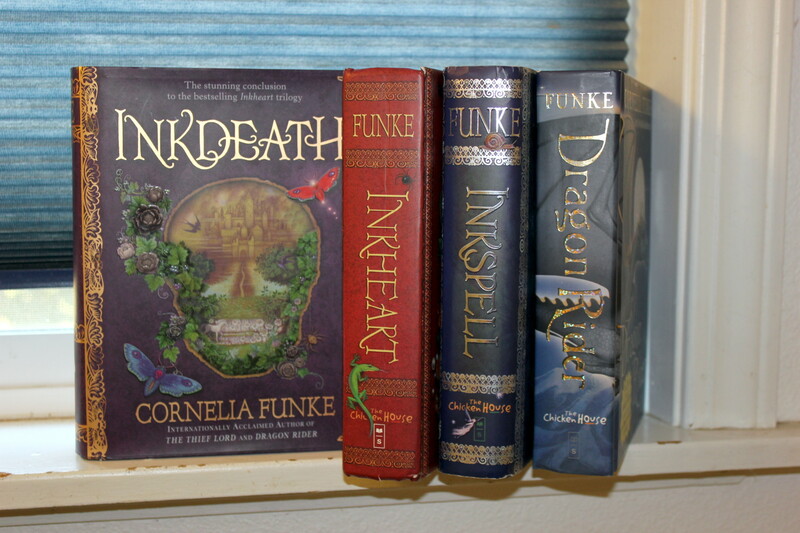 The entire set of Cornelia Funke’s Inkheart series plus a bonus book. $4. Plus, the two women running this yard sale were witty and well-read. We stood and critiqued a number of YA popular novels (Twilight, Hunger Games) and our insatiable need to read. 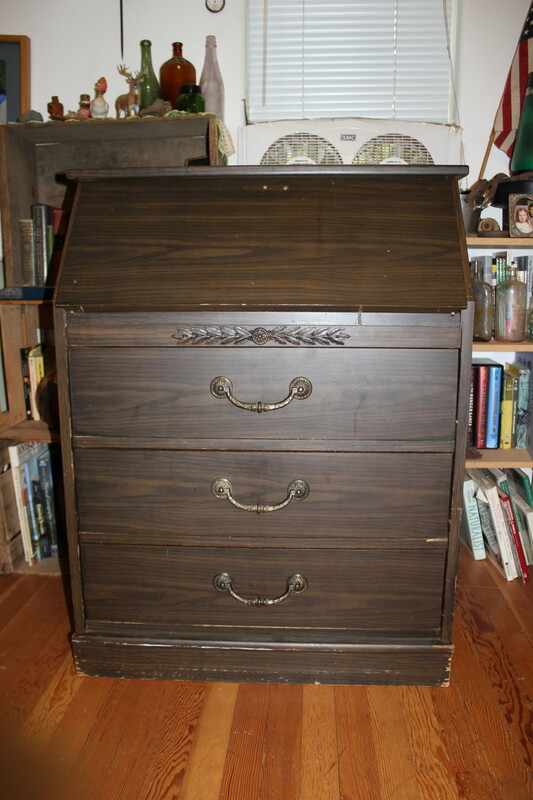 And I inquired about the little secretary dresser. $5. And they would help me load it. I pulled forward (which involved double-parking because just as I was going to pull forward, someone else stopped at the yard sale and parked in the way). Unfortunately, I had all the junk from all the other yard sales plus my groceries in my car – and the seats were up. I had to unload to lay the seats down in order to put the secretary in there. 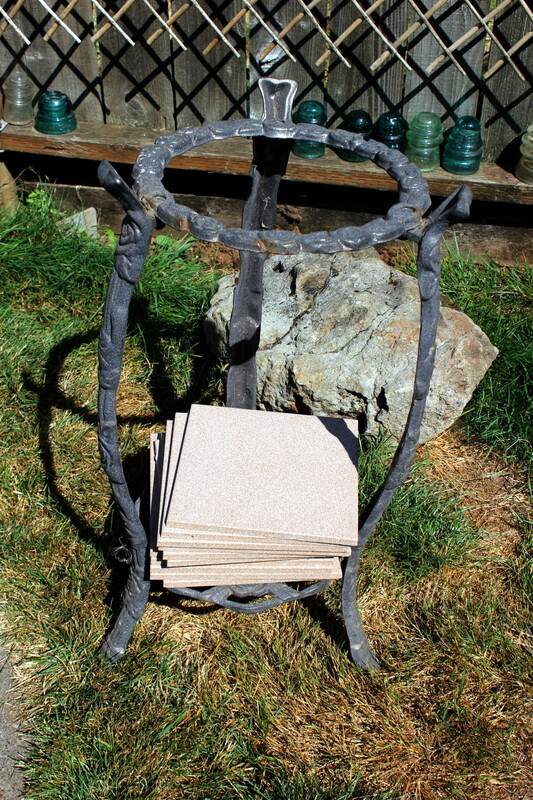 And that meant setting out the plant stand with the vintage 1960’s planter. “Oh! You found a vintage planter!” shrieked one of the women in delight. I left the planter with her. I got the secretary in the house and up the stairs, but I have to clear a space for it in my studio. It’s a bit beat up, but quite functional. 39″ tall, 30″ wide, 16″ deep (before the desk is opened). This is how it looks when the shelf is up. 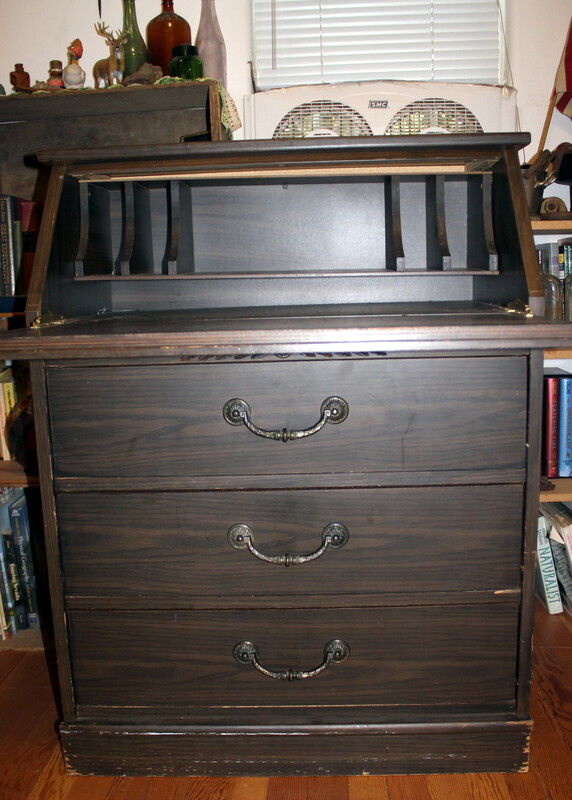 My mother had one (hers was more of a desk below) but my brother inherited that. I like this one, too. And for the money I spent at the last yard sale – it was the very best one. Now I am going to go sit out in the shade of the Hawthorne tree and reread Inkheart before I get started on the rest of the series. I may even watch the movie tonight. OH, love the vase, love the secretary! 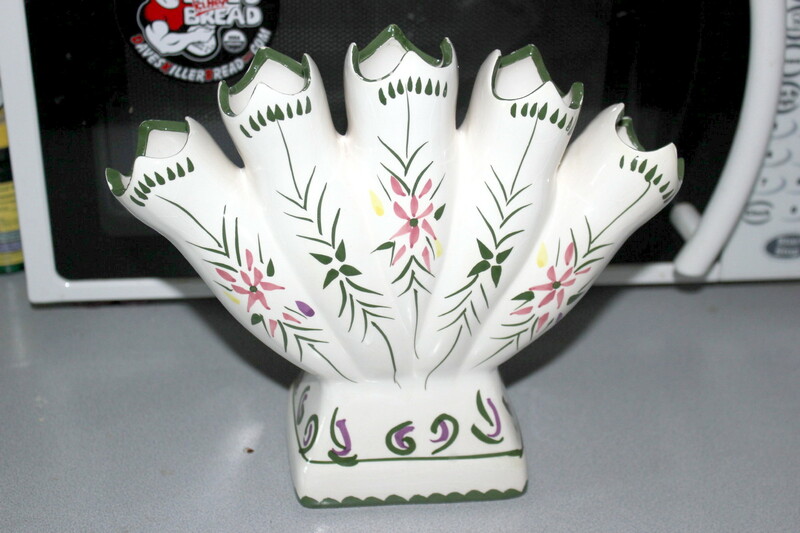 about your cast iron bird, nothing goes on top of it , it is actually 1/2 of a pr of bookends…..u have the male….. Thank you, Peter! I do appreciate that information.